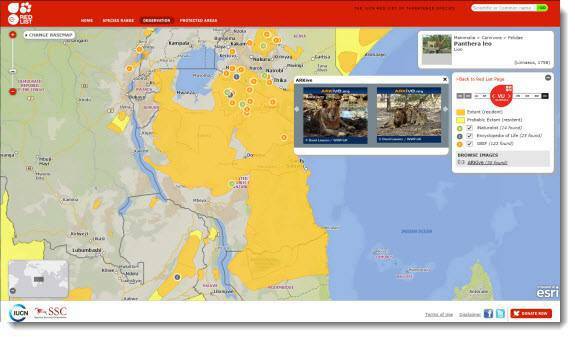 To inform the world about the important connections between threatened species and protected areas, the International Union for Conservation of Nature (IUCN) partnered with Blue Raster to create the IUCN Red List Mapper. This interactive mapping application combines two significant global biodiversity datasets—IUCN’s Red List of Threatened Species and the World Database on Protected Areas. Now conservationists, scientists, policy makers and concerned citizens can instantly see the geographic range of a threatened species overlayed with protected areas. The IUCN Red List Mapper also provides access to geolocated species information from open data and citizen science initiatives, including the Global Biodiversity Information Facility, iNaturalist, and the Encyclopedia of Life. Placing these current images and observations of threatened species in a geographic context will help conservationists’ efforts to monitor the status and range of threatened species. The application was launched at the IUCN SSC Chairs’ Meeting 2012 in Abu Dhabi.